Sergeant Chesna was shot and killed with his own service weapon after responding to reports of an erratic driver on Burton Terrace, behind South Shore Hospital, shortly after 7:30 am. When he arrived at the scene he discovered that the vehicle had crashed and he found the driver vandalizing a home nearby. The man attacked Sergeant Chesna, striking him in the head with a large rock. The subject then disarmed him, shot him in the head and chest, and fled the scene. Sergeant Chesna was a U.S Army veteran and a recipient of the Purple Heart. 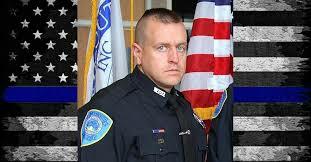 He had served with the Weymouth Police Department for six years. He is survived by his wife and two children. Sergeant Chesna was posthumously promoted to the rank of Sergeant.